Well Ton, Rob and Nick, guess what….. 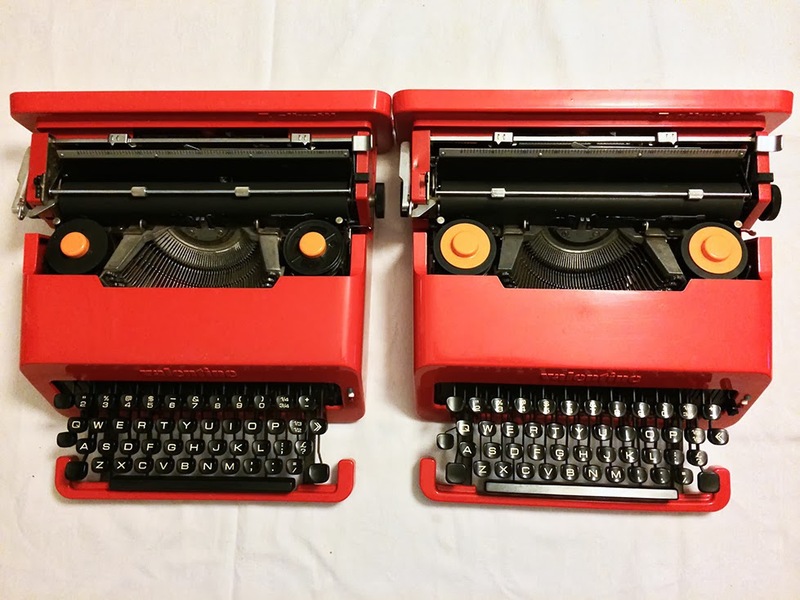 In the past few days both Nick and Ton have picked up Olivetti Valentine machines of their own. Here’s Nick’s blog on his purchase, which had followed Ton’s which can be found here. I was looking through Gumtree when I noticed a blurry photo of an Olivetti Valentine, at a price that was quite below $100. That’s right BELOW $100. Maybe not the $15 typewriter that Nick got, but it was cheaper than most machines I had seen by more than half. However the photo wasn’t all that great, and it was difficult to figure out what the condition of the machine was in, so I just forgot about it for a second. A split second. Then I sent the guy a message. 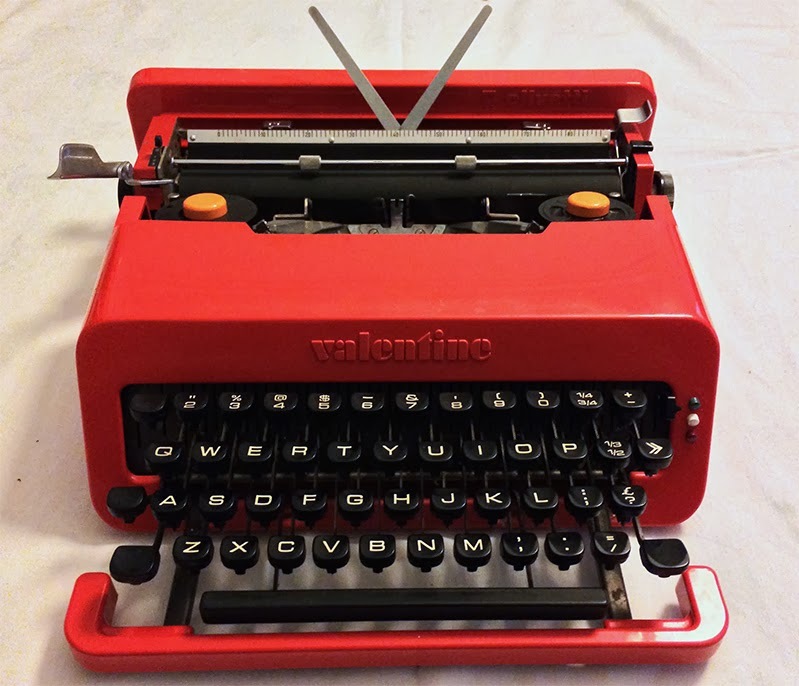 Now, most of you may remember that I have had a very strained relationship with an Olivetti Valentine that is already in my collection. A machine that I eventually managed to return to operational condition, before it almost sent my fragile mental state into decline. So I drove over to Scarborough and had a look. I gave the typewriter a run on the seller’s kitchen bench, and I was surprised by how nicely the machine ran. It had clearly been maintained – even though it was now full of dust, dirt and… a few scraps of paper. The storage case was in excellent condition, despite there being ‘shed debris’ smeared onto the crinkles of the plastic. But it wasn’t scratched or cracked, and the rubber catches were still in perfect order. So, I threw down a handful of dollars and the typewriter was soon in my possession. I got it home and quickly scrubbed the fmuck out of the case and the back shell of the typewriter, and just put it on the kitchen table to get a few happy snaps of it. The red is such an endearing colour, and Ms Jane noticed it as I carried it past her. “Oh, that’s a pretty red”! I’ll probably do some better photos in the future for my blog and database, but these will do for now. I decided that when I bought it, that I could probably service it an re-sell it for a good deal more than I bought it for. But I’m not sure I want to sell this one now. A friend of mine was wanting my other Valentine some time back, and I may pass that one onto him. Or just sell it. It has a bit of a crack in its storage case which I can probably fuse back secure, although it probably doesn’t need it. The condition that it is in, it would sell anyway as I have spent a fair bit of time nursing it back to full health. I feel like I have started a Harem. Two Valentines. If I just started talking about ‘my two valentines’ with the nurses at work, they’d probably think that I have suddenly become a man of ill reputation. The guy that I bought the Valentine off had owned it since new. However he didn’t have the manual for the machine, and for that I was a little sad. He bought it in 1971, and had shared it with his now ex wife for years. However, when they bought themselves a computer eventually, and as such the typewriter ended up being shoved into storage for quite some time. And now, I’m its second owner. As I was leaving, I asked him what prompted him to buy this typewriter originally. It turns out that he was working in the printing industry at the time, and wanted something specifically that had very stylish and different design. He was a very chatty chap, so I’d dare say that he worked in sales. So there we have it. I’m feeling the Valentine love tonight. And you know what? Despite the lack of a decent ribbon in this machine, It types actually quite nicely. I guess that’s what you get when you find a machine that isn’t a total basket-case from the go. I’d prefer it over my Lettera 32 to be honest. It reminds me of when I first started talking to the typosphere and Cameron over at Living in the woods, and he told me about his two machines. ‘Two Valentines” I questioned. “Why”! But as it turned out, I have ended up in the same situation. Anyway, may as well let my original Valentine finish off this blog post. 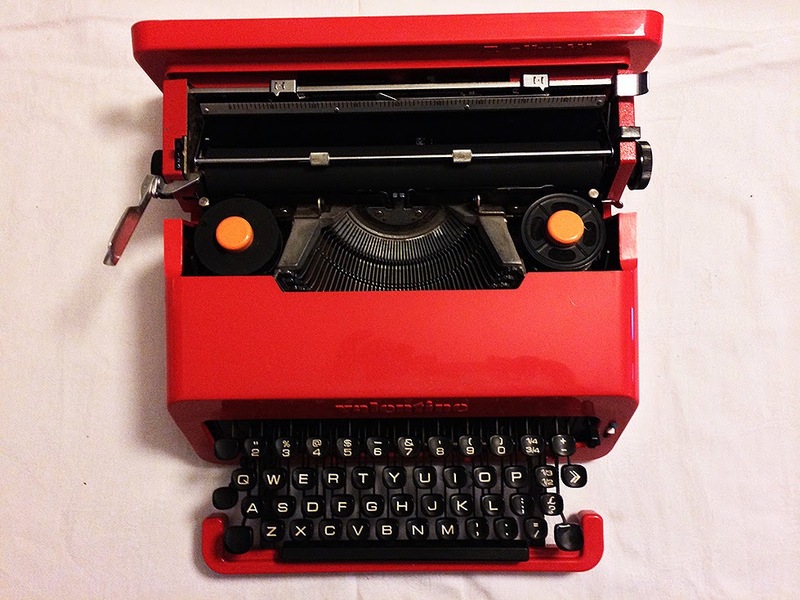 December 9, 2013 in Gumtree, Olivetti, repair, typecast, typewriter, Valentine. The seductive allure of my Valentine. 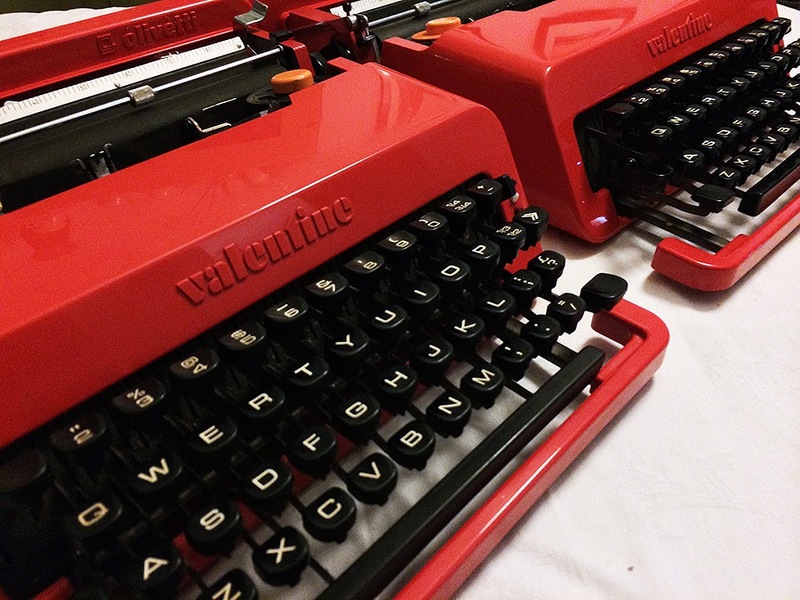 The ‘Not a Valentine’ – Sottsass’s Olivetti leather and steel bad girl. ← Just playing a small part with small parts. Incidentally, I might have new to sell.. Interested? I see there's a difference in the, well, areolas of the two machines. “I feel like I have started a harem,” haha! Well, I guess Valentine serendipity has crossed continents, congratulations! If I were you, I'd keep the older model (smaller areolas!). I'm curious, where were each manufactured? You need to say yes, writelephant! On the other hand… Quite a few of these popped up suddenly all around the world… I just hope this is not an invasion – you know – War of the Worlds/Mars Attacks kind of thing (it is a RED Planet after all… 😉 ). Sci-Fi novel for the next November anyone? Your new Valentine look wonderful. 🙂 Mine is a bit scuffed up, which is probably why I got away with the $15 in the first place. You said what I had hesitated to mention…that I like mine better than the Lettera 32 I used to have. Hooray for pinning down a year on that serial number! Though mine, 2034426, is nothing like either of yours. You've forgotten I was given another one last week. It's so good to hear that your second Valentine is providing you with a more positive experience than the first! Some of you in the Typosphere may recall that I have two Valentines (one in pica and one in elite). They are reasonably good typers, Not fantastic, but respectable. I've typed on worse! The REAL test would be to type many pages on a Valentine, to see how it holds up & feels over the long haul. I certainly didn't miss that! And oddly, I would probably describe them in the same way. Clearly! Rob just informed me that he got one too. Only their father can tell them apart. Sort of. Ish. Well…. God only hopes that I don't end up with triplets. Both of them are stamped as 'Spain, Barcelona'. AH! It could be…. or it could be more of a 'Attack of the Killer Tomatos' kind of thing. Well, I didn't have to pin it down. The guy bought it 1971, and even had a story to tell me how he remembered. Oh? Oh man! So there's 4 unearthed valentines? Oh man…. I had better edit this to reflect that! There we go. Edited. I've even changed the title. Here we go! Well, after I give it a big ol' service and complete clean, I think that is more than do-able! Speaking as a fellow with two Valetines himself, I don't see any problem with it! Well done on your latest acquisition. If there were Typospherical Scout badges, finding a Valentine in Australia for below $100 would surely get you one. They seem to be slowly going down in price. But I don't expect that to last for long. Don't worry… you won't come out in Valentine coloured lumps. I think that I might have a couple as well but only the typewriter god knows where. By the way, just who is the patron saint of typewriters? Well… I'd better see if I can find it in your collection!